J Chaturvedi, V Shobha, P Rout, B Alexander, R Nayar. Diagnostic Dilemma Of A Midline Destructive Disease - A Case Report. The Internet Journal of Otorhinolaryngology. 2009 Volume 12 Number 1. Midline Destructive Disease (MDD) is a condition that includes Idiopathic Midline Destructive Disease, Wegener Granulomatosis, Lymphomatoid Granulomatosis, Polyarteritis Nodosa, Allergic Granulomatosis, Foreign Body Granuloma and Limited Wegeners. The term idiopathic is applied to a MDD when extensive diagnostic workups have failed to reveal anything other than inflammation and necrosis. It remains localized to the head and neck and can be differentiated histologically from other MDD by the presence of sheets of characteristic polymorphonucleocytes. A case of Idiopathic Midline Destructive Disease in a 55 year old patient is presented to highlight the issues faced in management. We present a case of IMDD in a 55 year old male patient with review of relevant literature to highlight issues in management. A 54 year old known asthmatic was referred to St John’s Medical College Hospital, Bangalore, South India in February 2009 with nasal obstruction, foul smelling blood stained nasal discharge, left sided acute dacryocystitis and a palatal ulcer since 6 months. [Figure 1] There was no history of substance abuse. Figure 1 .Palatal perforation involving anterior part of hard palate. There was no evidence of granuloma/ Fungi or Lymphoma. A working diagnosis of Wegener’s Granulomatosis was tendered and treatment with cyclophosphamide was planned. A Pus culture obtained from the nasal cavity showed a mixed growth of Staphylococcus Aureus, Escherichia Coli, and Pseudomonas Aeruginosa. He was treated with injectable Amikacin 20 mg/kg based on the sensitivity report. Single dose of IV cyclophosphomide along with MESNA was administered. During his stay in the hospital he developed cellulitis in his right forearm and treatment with Cyclophosphomide was deferred to avoid further spread of infection. He was therefore discharged on a course of oral antibiotics. Figure 5. Septal perforation along with pus in floor of left nasal cavity. - Figure 6. Perforation in hard palate communicating with floor of left nasal cavity. Figure 7. H & E X 200. Vasculitis noted in areas adjoining necrotic tissue. Figure 8. H & E X100 Sheets of typical polymorphs with few lymphocytes and plasma cells. Special stains for fungi, ZN stain for Tubercular bacilli & modified Fite Faraco stain for Lepra bacilli were negative. There were no atypical lymphoid cells seen. 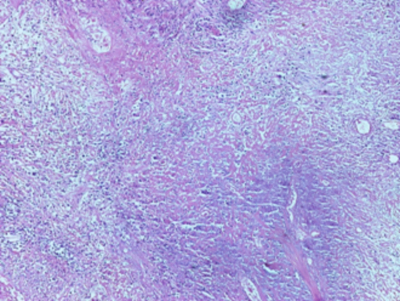 As there was no evidence of granuloma on histopathology and the clinically rapidly pogressive destructive nature of the disease, the diagnostic criteria for WG was unfulfilled and the diagnosis was revised to an Idiopathic Midline Destructive Disease. The treatment plan was consequently altered to radiotherapy. However, he expired at home before the scheduled date for radiotherapy. Autopsy permission was sought but not granted by the relatives. There are multiple criteria for WG out of which the presence of 2 or more criteria has a sensitivity of 88% and a specificity of 99%. Our patient presented with acute dacrocystitis, palatal ulceration, nasal lesion and blood stained nasal discharge . He had no renal or pulmonary abnormality therefore satisfied only single criteria for WG. (Table 2) A previous history of asthma has been noted to be associated with WG. Eye involvement may range from a mild conjunctivitis to dacryocystitis in about 52% of patients with WG. Hence on the basis of clinical presentation and biopsy findings the initial diagnosis was Wegeners Granulomatosis. WG has been considered inspite of a negative C-ANCA and treatment with cyclophosphomide administered. [2,4]It was felt that undue delay in diagnosis would be detrimental to the patient as untreated WG has a poor prognosis, with the majority of patients dying within two years. (7) The prognosis is good if the disease is treated early and prior to significant renal involvement. Treatment with cyclophosphomide was planned on the basis of histopathology, even though all diagnostic criteria were for WG were not fulfilled. On his second admission, the diagnosis was reviewed and in the absence of granulomas and presence of polymorphonuclear cell infiltrate with progressing destructive nature of the condition on the repeat biopsy, IMDD was considered more likely . (6) Note that classically IMDD should not show evidence of vasculitis . However, in the specimen biopsied, viable tissue showed no signs of vasculitis. The vasculitis noted was only in blood vessels lying close to the necrotic tissue without any evidence of fibrinoid necrosis. Hence this finding was not considered to contradict the diagnosis of IMDD. Clinically, Wegener’s granulomatosis though systemic rarely erodes through the soft tissues of the face or palate, however IMDD on the other hand is far more destructive locally in the head and neck region. (11) It has been differentiated histologically from Wegener Granulomatosis by the presence of sheets of characteristic polymorphonuclocytes. Interpretation of the histological findings in conjunction with the clinical presentation allows separation of these two entities. Distinction between IMDD and Wegener’s granulomatosis is of paramount importance as management differs. Radiotherapy (34 – 60 Gy) is treatment of choice for IMDD and Chemotherapy with cyclophosphomide for WG. (1, 6)Untreated, IMDD has a very high mortality of almost 100% .The cause of death is due to refractory septicemia, erosion into major blood vessels or penetration into CNS. (9, 10) Our patient most probably died of septicemia caused by an intercurrent illness. Other midline destructive diseases were considered. Lymphomatoid Granulomatosis was ruled out as it occurs primarily in extranodal tissues (e.g., lungs, skin, central nervous system, kidneys). Limited WG was ruled due to absence of typical pathology and absent renal or pulmonary involvement. Polyarteritis Nodosa was ruled out as it affects only small to medium-sized arteries. Allergic Granulomatosis and vasculitis of Churg-Strauss Syndrome was ruled out as it is characterized by the diagnostic triad of asthma, systemic vasculitis, and peripheral eosinophilia. The prognosis is excellent for patients with eosinophilic granuloma where surgical curettage of the lesion is sufficient. (8) Foreign-body granuloma was ruled out as there was no evidence of any foreign body or granulomas. There is a need for a high index of suspicion for MDD and close co-operation between the clinician and pathologist so that diagnosis and treatment can be started without delay. The controversies regarding histopathology and clinical presentation caused a delay in starting treatment for our patient could have contributed to the eventual unsuccessful outcome. 1. Oei A, Lemmerling M, Mortele K: Skull base granuloma: an unusual location of idiopathic midline destructive disease. Eur Radiol; 2001;11:1076-1078. 2. Borges A, Fink J, Villablanca P: Midline destructive lesions of the sinonasal tract: simplified terminology based on histopathologic criteria. Am J Neuroradiol; 2000;21:331-336. 3. Proulx GM, CaudraG I, Ferry J: Lymphoma of the nasal cavity and paranasal sinuses. Am J Clin Oncol; 2003; 26:6-11. 4. 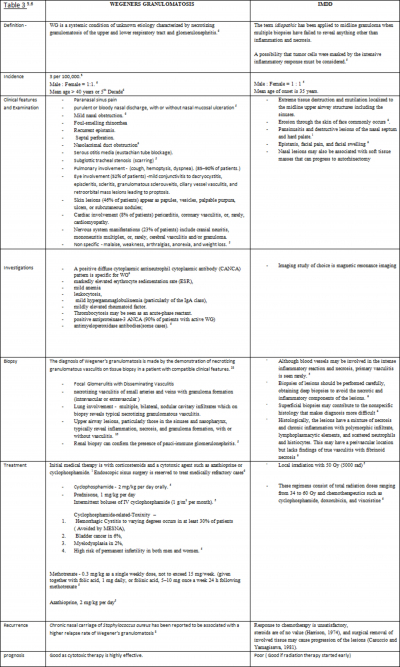 Hiz f, Cinar M, Karagol T, Bozkurt D: Wegener’s Granulomatosis: Case report. The Internet Journal of Neurology; 2007; Volume 6. Number 1. 6. 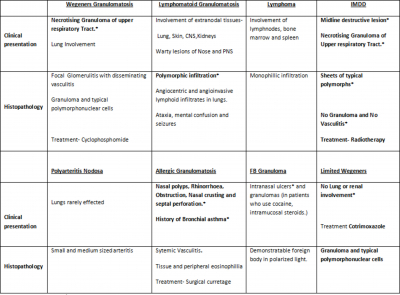 Bailey J, Johnson T; Granulomatous and Autoimmune Diseases of the Nose and Sinuses. Head & Neck Surgery – Otolaryngology: 4th Ed. Texas. Lippincott Williams & Wilkins.2006. 9. Wolff S M ; Midline granuloma; Harrisons Principles of Internal Medicine.13th Ed. New York McGraw Hill Publication, 1994. 10. James O, Longo D: Malignancies of lymphoid cells; Harrisons Principles of Internal Medicine.16th Ed, New York. McGraw Hill Publication.2005.